Letters exist emanating from the Falklands from the earliest date known of 15th February 1800. 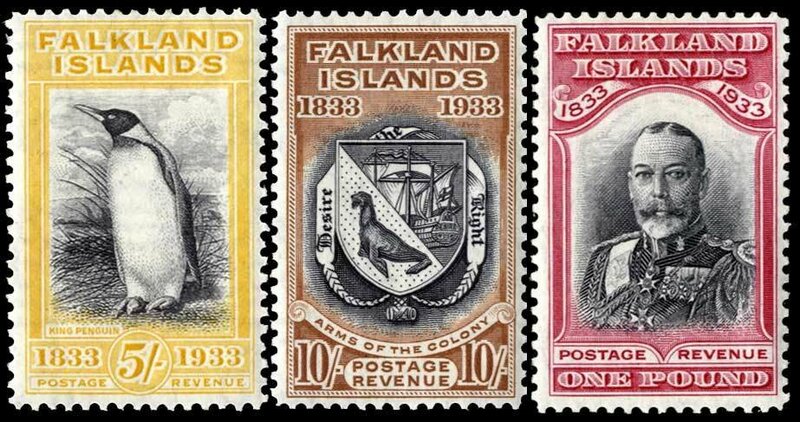 After local Black or Red Franks were used on envelopes from 1869, the first Falkland Islands postage stamps were issued in 1878. From the first issue through to the present day the stamps have been internationally recognised for their design and production qualities. The 1898 Victorian high values were voted among the most beautiful stamps ever produced. 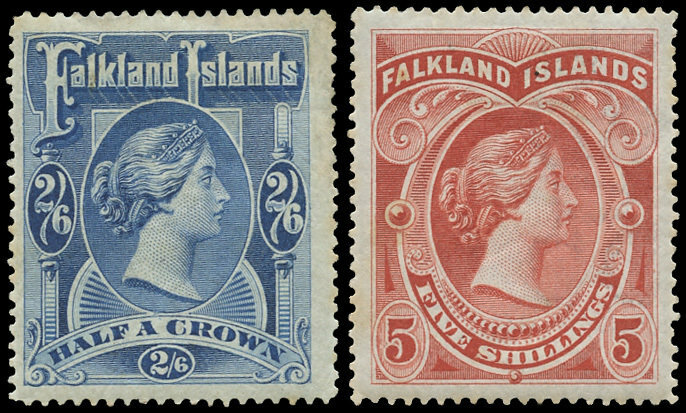 The magnificent 1933 Centenary set to £1 is the most sought after Falkland Islands set of stamps worth many thousands of pounds. 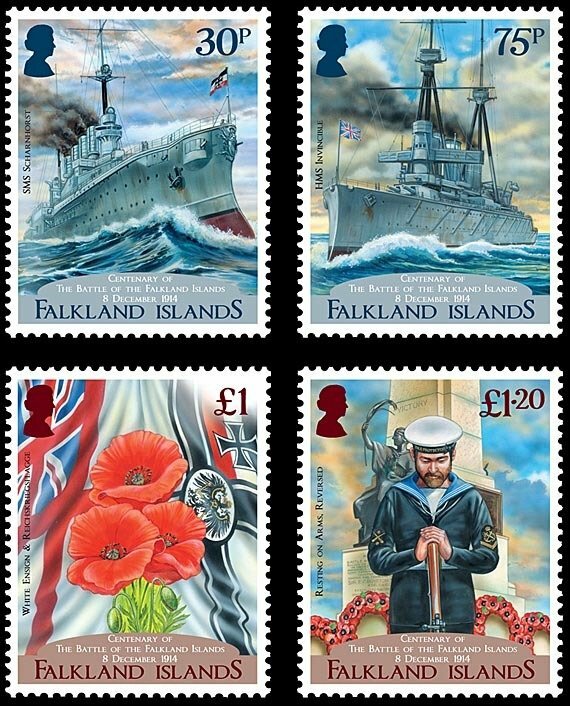 The Falkland Islands provide an area of absorbing interest to the postal historians, particularly through the carriage of mail, initially by shipping companies under mail contracts and latterly by air. The conflict with Argentina in 1982 opened up a new element for the postal historian and this continues to the prese nt time with the presence of a British Forces Post Office at Mount Pleasant. The 20th century whaling activity in South Georgia and the exploration of Antarctica has provided other absorbing areas of interest to collectors. The pound sterling is the currency of the Falkland Islands and it was introduced following the reassertion of sovereignty in the Islands by the British in 1833. 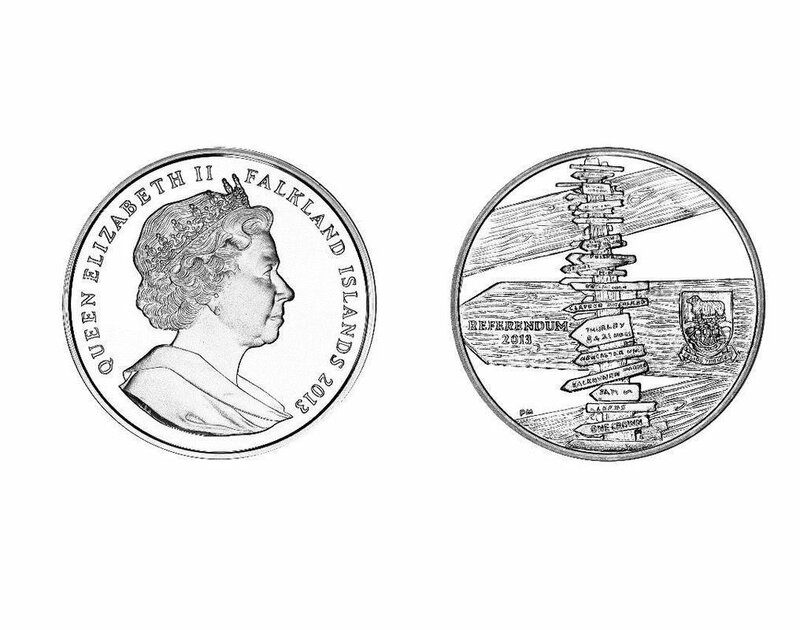 Although coins have been minted specifically for the Falklands Islands since 1974, it wasn’t until 1998 that the first legal tender commemorative coin was struck by Pobjoy Mint to celebrate the 50Th Anniversary of the Falkland Islands Government Air Service (FIGAS). 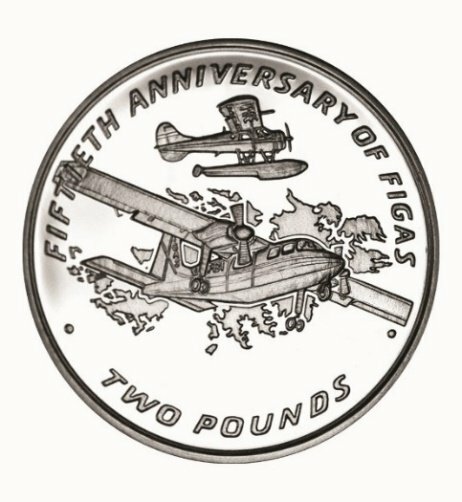 The FIGAS Coin itself depicts the Britain Norman BN2 Islander in the foreground flying over a map of the Islands, whilst in the background there is a DHC-2 Beaver Float Plane. Since then these collectors’ coins have been closely linked to the Falklands history and most coins were produced in Sterling Silver, Cupro Nickel and Gold. However, it wasn’t until 2006 that Pobjoy Mint really set them apart by producing the World’s First Magnetic Coin to commemorate the 150TH Anniversary of the death of John Ross and the Ross family. John Ross is recognized as the leader of the first expedition which determined the location of the Earth’s Magnetic North Pole and was knighted in 1834 and elevated to the rank of Rear Admiral in 1851. The design on the coin shows an impression of the Earth illustrating both the North and the South Poles with the ships Victory (upon which they sailed on the expedition which led to the discovery of the Magnetic North Pole) and Erebus (which James Ross sailed upon on his Antarctic Expedition). This achievement generated much interest within the numismatic community and a year later Baroness Margaret Thatcher LG OM PC FRS took part in the striking of the first coin produced to commemorate the 25th Anniversary of the Liberation of the Falkland Islands from Argentine occupation. Such a significant historical event could not have been celebrated by anyone else but the lady who led Britain to victory during the 1982 conflict. 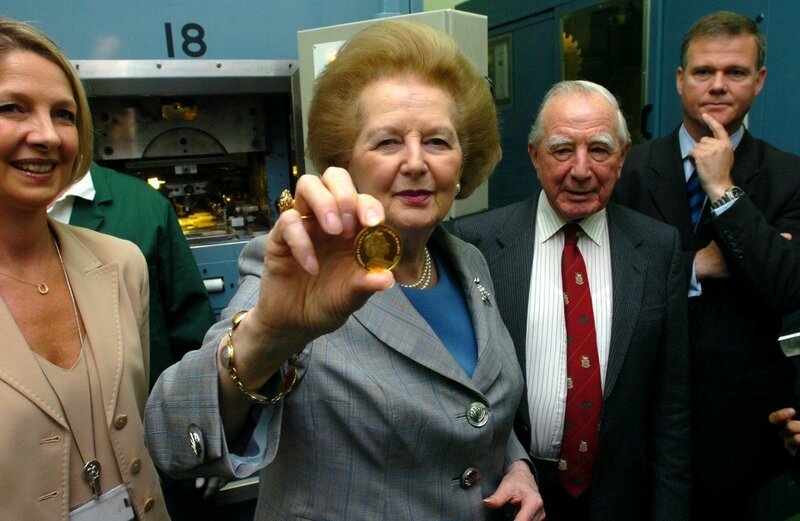 From Left to Right: Taya Pobjoy, Managing Director of Pobjoy Mint along Baroness Thatcher and Sir Rex Hunt, Governor of the Falkland Islands at the time of the invasion. In 2013 the Falkland Islanders had the opportunity to decide their political status and, in the referendum, an overwhelming majority decided to remain an Overseas Territory of the United Kingdom. To celebrate such important result a coin was produced featuring the famous World Directions Signpost near Stanley, which was erected by servicemen during the Falklands conflict. 2013 Referendum: 92% of voters turned out over the two days to take part and 99.8% of those voters were in favour of retaining the current political status. With so much technology around us, innovation was a natural step in the commemorative coins world and in 2014 a bi-metallic coin was issued to commemorate the Centenary of the Battle of the Falkland Islands. The coin attracted such attention that it was nominated by Krause Publications for the Coin of the Year Awards 2016 in the bi-metallic category. The Battle of the Falklands Islands is often referred to as the most decisive naval battle of World War I and also the last important instance of old-style naval warfare. Many of the coins issued over the years represent significant milestones in the Islands history but in 2015 a series was produced on behalf of four Overseas Territories (i.e. British Overseas Territories) to celebrate HM Queen Elizabeth II becoming the Longest Reigning Monarch in British history. This collaboration certainly highlights the development of commemorative coinage in the Falklands up to the present day. 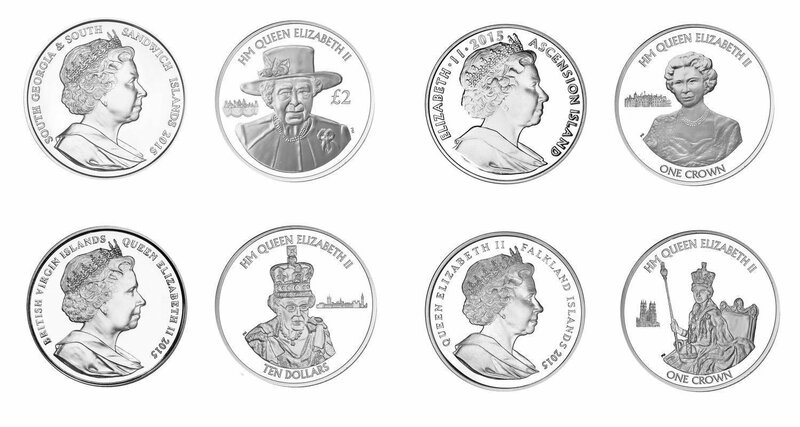 The four coins of the series were produced by Pobjoy Mint and they feature a portrait of Her Majesty throughout her life. 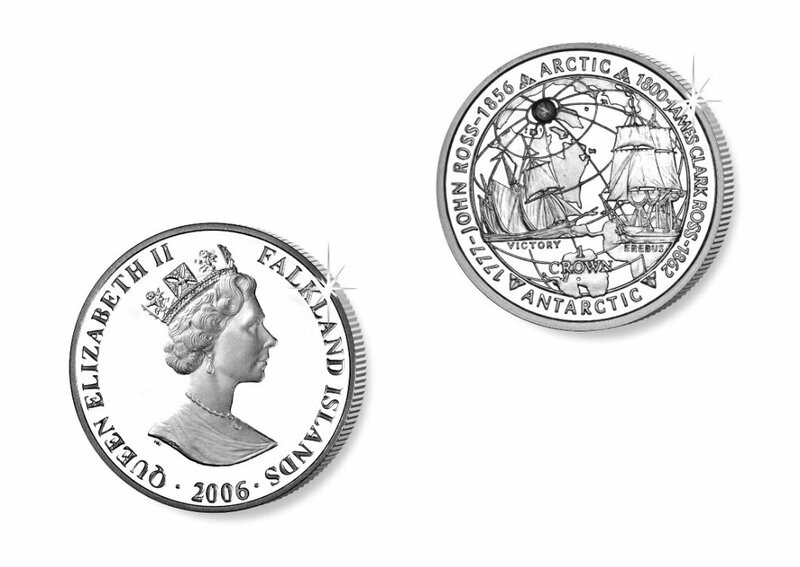 Some of the coins issued to date are still available to purchase along with many others produced for the British Antarctic Territory and the South Georgia and Sandwich Islands Governments. For more details or to place an order please visit www.pobjoy.com.